Calgary’s University District is not even built yet and already it’s scored one of the highest green certifications available. 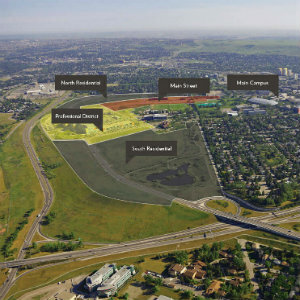 The 200-acre development in northwest Calgary, which will ultimately be home to some 17,000 people, became the largest residential project in Canadian history to earn LEED for Neighbourhood Development Platinum certification. The plan for the community earned the distinction for excellence in three categories: location, design and green building. James Robertson, the West Campus Development Trust president and CEO, said originally they didn’t start out seeking the LEED-ND designation. “It came about in a kind of unconventional fashion. We thought we’d done a great job, but we wanted third-party verification of the job we had done.” The developers applied for LEED-ND after they’d completed their plan. The U.S. Green Building Council developed the LEED-ND rating system to guide and assess community development projects that are then registered and certified through the Green Business Certification Institute. In Canada, the certification process is administered by the Canada Green Building Council to ensure it serves the needs in Canadian project terms. For the University District to meet the criteria for location, the plan includes housing close to jobs, diverse uses of space, protection of endangered species and habitat restoration, among other aspects. In terms of design, the plan calls for a walkable community that is affordable for a range of incomes. It includes a reduced parking footprint, public and recreational spaces throughout the neighbourhood, access to to transit facilities and connection to bike and foot paths. Finally, to meet the green building standard, the plan calls for water conservation both inside and out of the building through such measures as water-efficient fixtures and native and drought tolerant plantings; recycled content in the infrastructure; and light pollution reduction. “Our goal from the very beginning was to create a sustainable and vibrant community that residents felt proud of and the surrounding communities supported,” Robertson said. Once completed, the development will hold between 6,000 and 6,500 residences made up of townhouses and apartment-style condominiums. Those will be centred around a main street concept with about 200,000 sq. ft. of retail as well as 1.5 million sq. ft. of office development. Robertson conservatively estimated the price for the nine million sq. ft. development to be around $30-billion. Currently, the land, which the University of Calgary owns, is vacant. The university decided the land was surplus to its core needs for the foreseeable future and decided to infill the campus and make it more compact rather than spreading out, Robertson said. The development will also act as a source of revenue for the university. They’ve modelled the West Campus Development Trust on the University of British Columbia property trust and the Simon Fraser University Community Trust Endownment Fund. Robertson notes the UBC trust has been around for 25 years, has been responsible for significant development, and for contributing back to the school itself. “We’re all struggling to find funds to support great causes like universities and it’s another way the University of Calgary sought out to supplement their budget,” Robertson said of the West Campus Development Trust. Construction in phase one of the development is scheduled to begin in October with one of the two builders; the other will start in the sprint of 2017. The two builders partnered to work on the project are Brookfield Residential and Truman. Robertson said the test was to see if they’d be able to get builders to partner with them. “We were able to attract Brookfield and Truman, which are two very notable builders in the west, and in Calgary in particular. Brookfield Residential has built over 60 master-planned communities in Calgary. Truman is a family-run builder that’s operated for 30 years in the city. “So we’re very excited that not only have we done LEED-ND Platinum, but we’ve done it with two responsive builders and we’ve got lots of others interested,” Robertson added.